results after day 4. The bold marked players have reached the cut of the required 7 games already or are half way close to this. Two tournament days remaining to get your games in!!! Maybe the cut will be lowered after day 5 if not at least 6 players will reach this cut then. Next games next friday! Till then cya in the winner picks tournament a nd the classic tournament! FINAL DAY 29.10.2017 before the Award ceremony! we had some great games and Pauley had a great run. 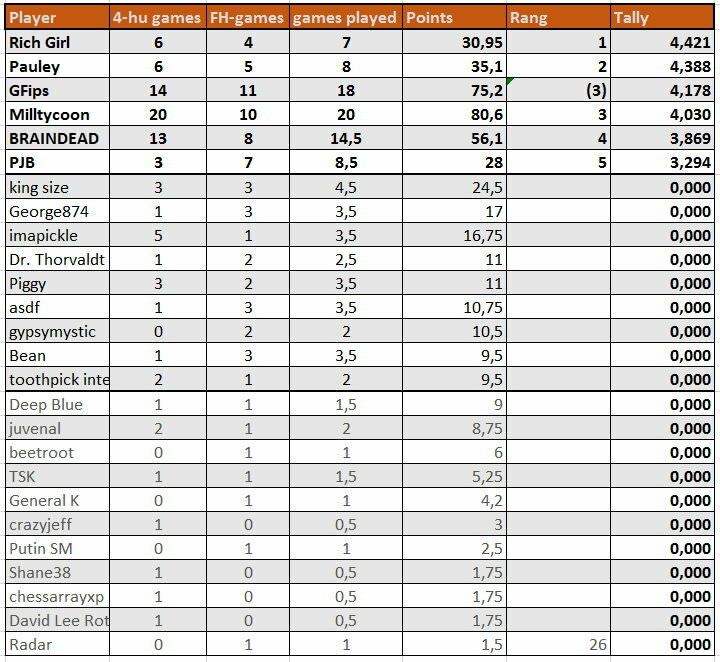 34 games played so far. Rich Girl i still in the lead, followed closely by Pauley and milltycoon before the last day! Still everybody has the chance to win. 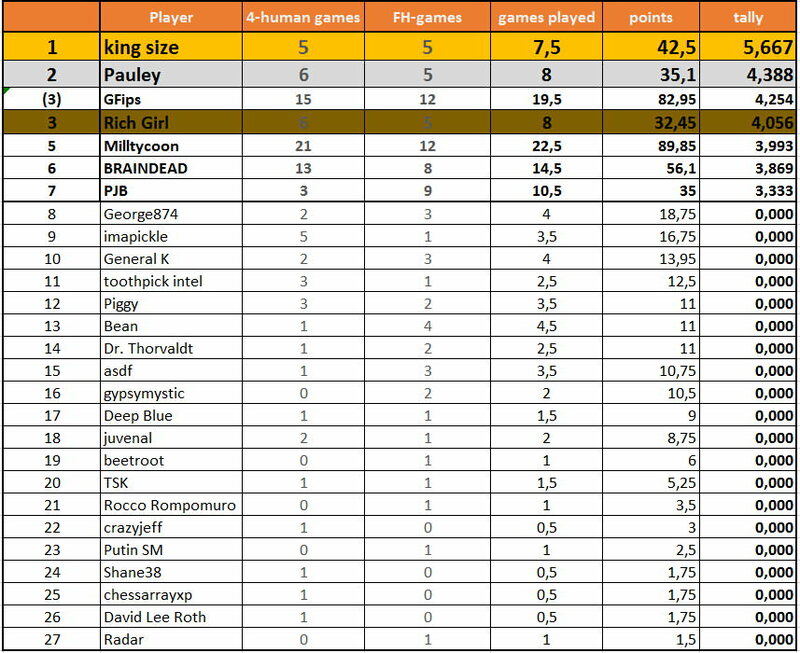 king size, George874 and imapickle have good chances to win, but are still missing some games to get a tally. 7 games (4 human games Count as half games!) required to get in the ranking! FINAL DAY will be played on 29.10.2017 (7pm London / 8pm Berlin) before the Lux Award Ceremony. Tourney will end with the Lux Award Ceremony! Thanks already to everybody participating. See you all in sunday for the final! 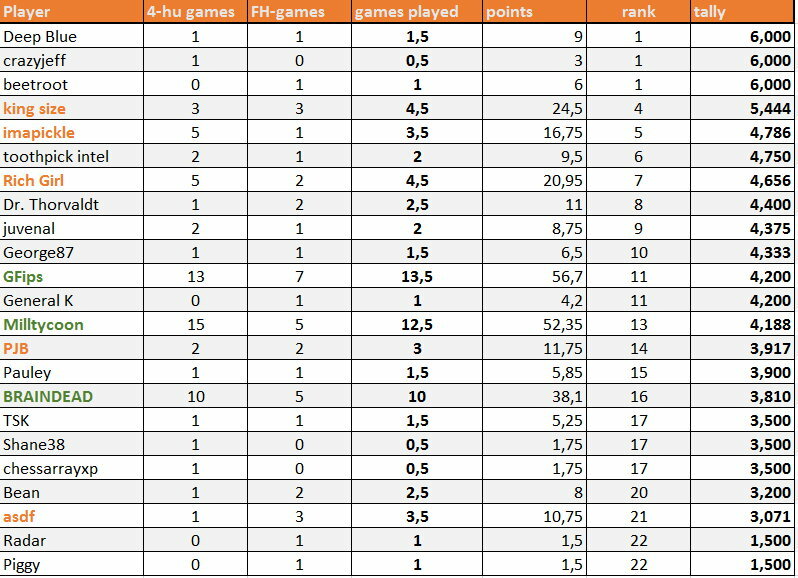 FINAL RESULTS ATFTER 6 DAYS AND 38 GAMES !!! (3rd: GFips) <--- as I was hosting the tourney my own result does not count and Rich Girl gets 3rd!! thanks everybody for participating !!! Congrats winners!!! It was fun.